The Next brings it all together—brilliantly. Your ideal is a place where downtown spirit meets community character. An extraordinary user experience where residential, retail and green spaces are linked beautifully. 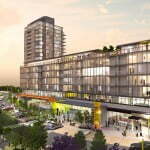 The new heart of Central Park, one of Ottawa’s most coveted communities and prized locations. The Next connects you to over a thousand acres of green space—and to scores of the city’s top outdoor attractions. Fresh air and room to move? They come included. The Farm’s many back roads and bike paths are popular routes for workouts and commutes alike. The Arboretum, Dow’s Lake and the Canal are just a walk, run or bike away. It’s a wonderland in all four seasons—so get out there. The Experimental Farm is a National Historic Site and one of the city’s treasures. Take a moment to consider the rarity of an urban lifestyle so close to a vast, permanent natural preserve. Living at the Next puts you first in line. The panoramic views across the open fields are best at twilight, with the skyline lights twinkling. Sunrises and sunsets are not to be missed either—and with floor-to-ceiling windows, you never will. Landscaping at the Next weaves the Farm’s grassy fields and woodland into the fabric of the site. Trees planted along the Merivale side create a natural break with the world rushing by. The Next is made for getting the most out of life. Make every day a holiday with resort-style amenities awaiting you in your building and throughout the site. Enjoy every starry night to the fullest with a space built for gathering and gazing. Just outside the lounge is a spacious patio area with ample seating, a stylish fireplace and BBQs you can use. Again: enjoy. Floor-to-ceiling windows are the perfect conversation starter in the Sky Lounge. This sophisticated space is a great place to unwind and mingle with friends and neighbours. Online reservations are easy. The Next offers you unlimited ways to work up a sweat. Hit the Farm trails for running or biking, or beat the elements at the fully equipped fitness centre, complete with weights, trainer machines, spinning and more. Suites at the Next showcase smart design in every detail. The aesthetic is modern and minimal, functional and liveable. Clean lines. More light. More space. Everything in its right place. The kitchen is the hub and the heart of every home—and The Next’s open kitchen concept draws that warmth into the living space. An innovative island saves space as a combined work station and dining area. Sleek, Scandinavian-inspired bathrooms do away with bulky cabinets for an airy, high-style spa feel. Double-sink floating vanities and powder rooms with showers are standard even in smaller units. Full-length pocket doors slide open to reveal structured storage space. Hide away your flat screen or simply stash your things—ample closet space and inset shelving make it easy to maintain a minimal look.